We attended our first camel race today. The race measures both speed and endurance. The track is 5 km/3 miles long and it takes the group of camels an average of 7 minutes to make it around the track. There were about eight consecutive races. 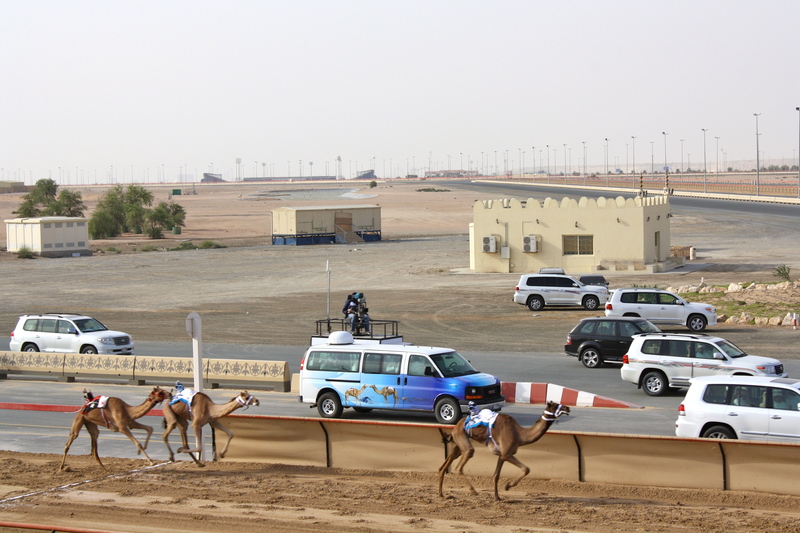 It gave the feel of what I am assuming a horse race must feel like; there was an announcer and camels ran. 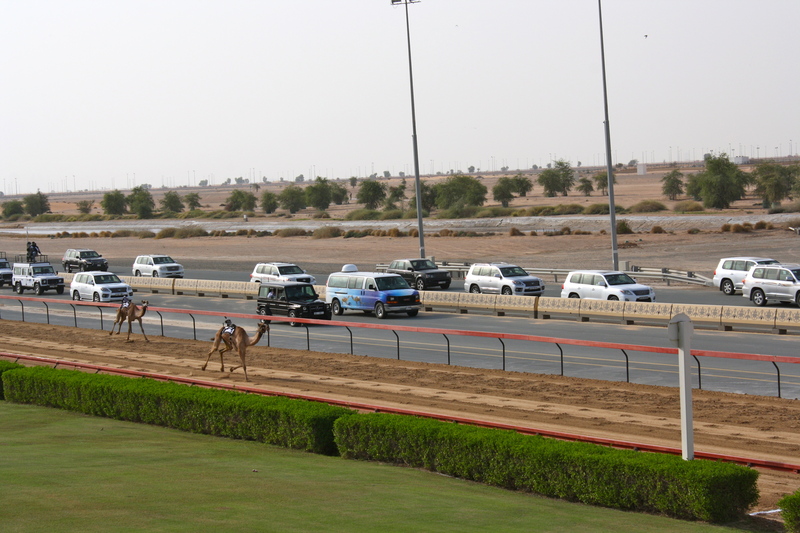 The differences were that the announcer spoke Arabic, the owners of the camels and maybe race enthusiast rode along side the camels in their cars and trucks, and the jockeys were robots. The UAE issued a law in 2005 banning the use of young foreign boys (usually from Pakistan and Sudan) from being used as camel jockeys. The boys ranged in ages from 4 -7 years old. They were used because the lighter the weight on the camel, the faster it is able to go. However, some of these boys were kidnapped and most of them were malnourished in oder to keep their weight low. The robots come with a built on whip and the owners of the camels control the robots with a handheld remote the size of car remote. The camel race wasn’t interesting after the first two races. 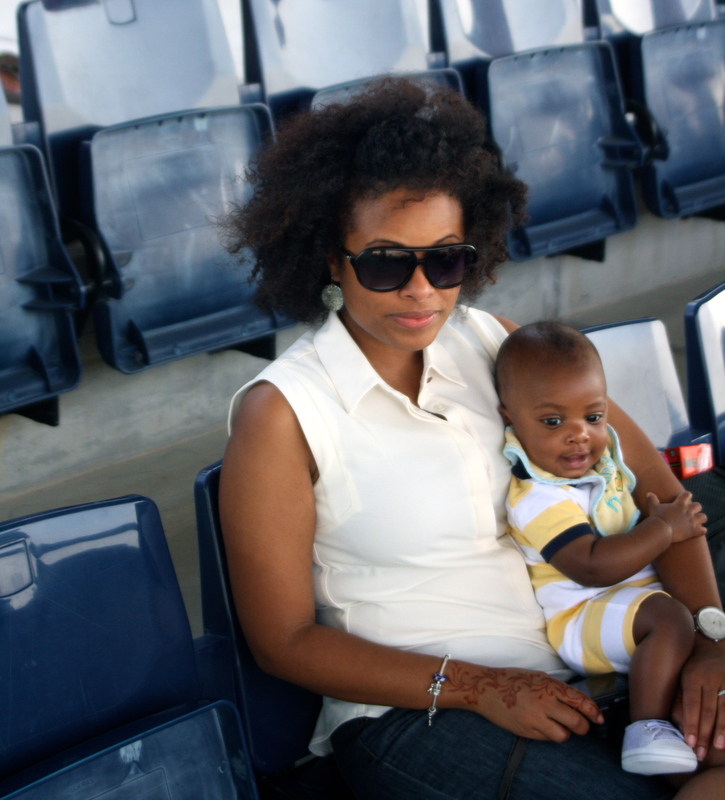 We did sit there for about six of the races because it was very nice outside today. 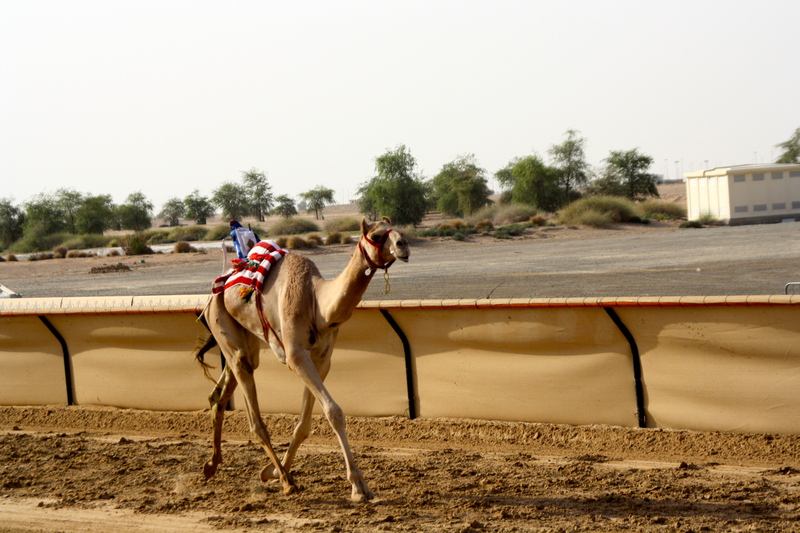 The track is so long so we couldn’t see the camels while they raced. We saw them start, sat there for 5 minutes, then we saw them coming back around. The track does have TVs in the stands but they are maybe 37 inches so depending on where one sits, they aren’t able to see it. The admittance to the camel race was free because the sponsors are trying to get both locals and residents to help keep the tradition alive. The place wasn’t packed at all. I hope they come up with a way to increase support. 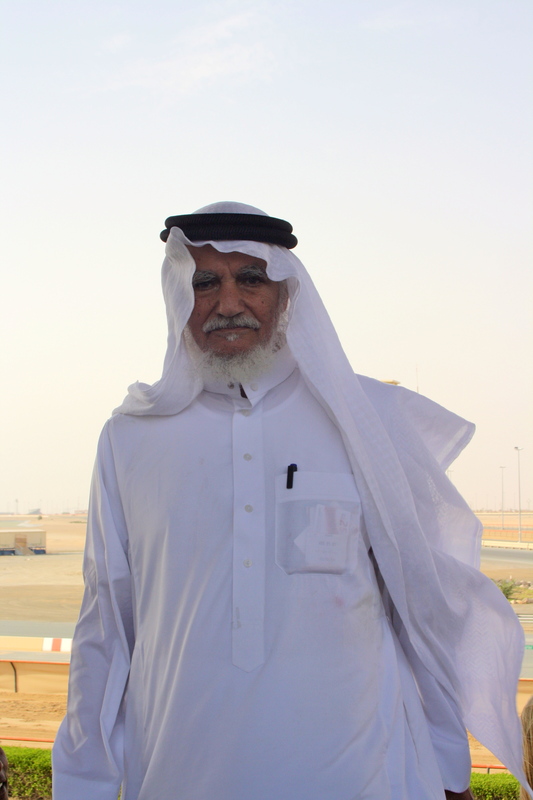 This gentleman was waking around saying “very good” to all of the expatriates that were at the race. He walked in front of us as Terrence was taking a picture and decided to pose.. He is wearing the traditional garb for this country. Which means congratulations on the arrival of a solemn festival. Tuesday will start the four day long Eid Al Adha (Feast of Sacrifice), which is an Islamic holiday that celebrates Ibrahim (Abraham) willingness to obey Allah and sacrifice his first son Ishmail. In this story Allah intervened with the ram only after Ibrahim stabbed Ishmail. Ibrahim was blindfolded and after he stabbed his son, he took off his blindfold and there lied a dead ram in front of him, and his son was standing at his side. Animals are sacrificed to commemorate the story. Last year, around this time, we saw flyers in our supermarkets that advertised both the selling and slaughtering of animals. I believe that sheep are most commonly sacrificed here as my students kept drawing sheep and making reference to the animal during our celebrations at school last week. Since Ibrahim is also known as rebuilding the Ka’aba (a very sacred monument in Mecca), Hajj (Islamic pilgrimage to Mecca) is also highly regarded during this time. My students told me that this holiday, for children, is like our Christmas. From the exchanging of gifts perspective I too viewed this holiday that way. I, however, was super shocked that my students actual said it since Christian holidays aren’t acknowledged in this country and Western teachers are forbidden to discuss it in the classroom. I heard that one teacher was written up because she made a work packet for the winter break and one worksheet had Christmas trees on it. But I digress; children receive gifts, chocolates, and money during this holiday. 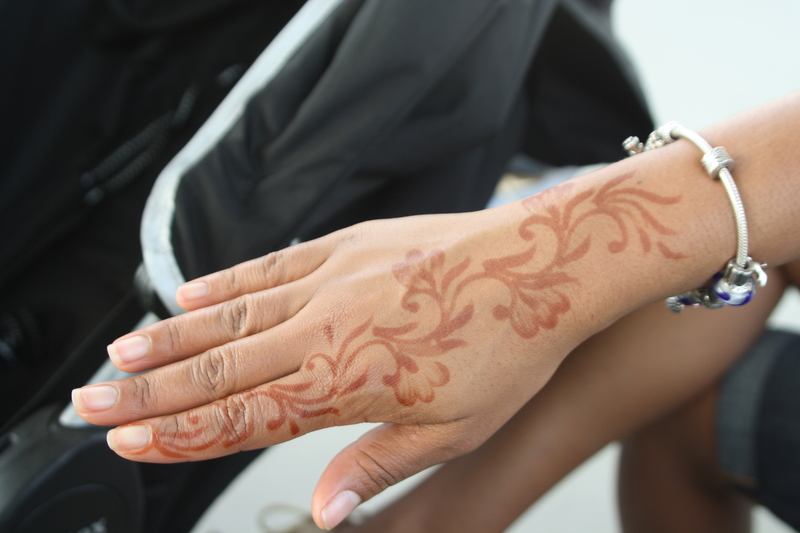 As with any celebration here, henna is really popular. Artist were invited to our school to create henna designs for the both the teachers and female students during our Eid celebration assembly on Thursday. While I usually decline, I decided to go with it this time. 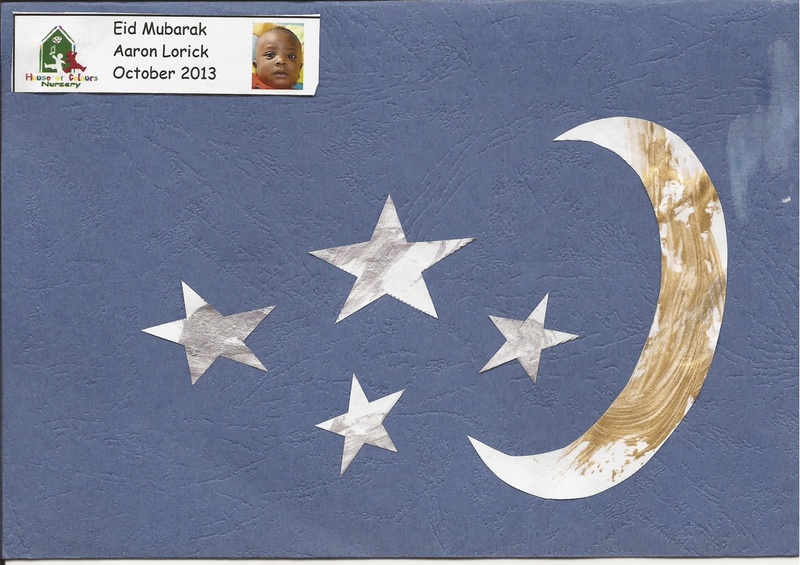 Mila and Aaron’s school also celebrated Eid on Thursday. Children were invited to wear their “party clothes” and bring finger foods. 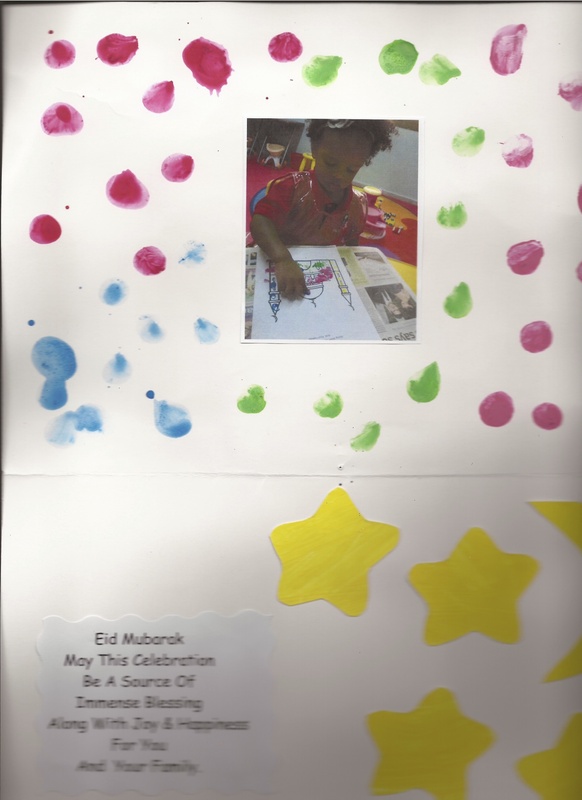 Upon picking them up their teachers handed me cards that they were assisted in making for the holiday. When I first got the cards, I didn’t think anything of them. 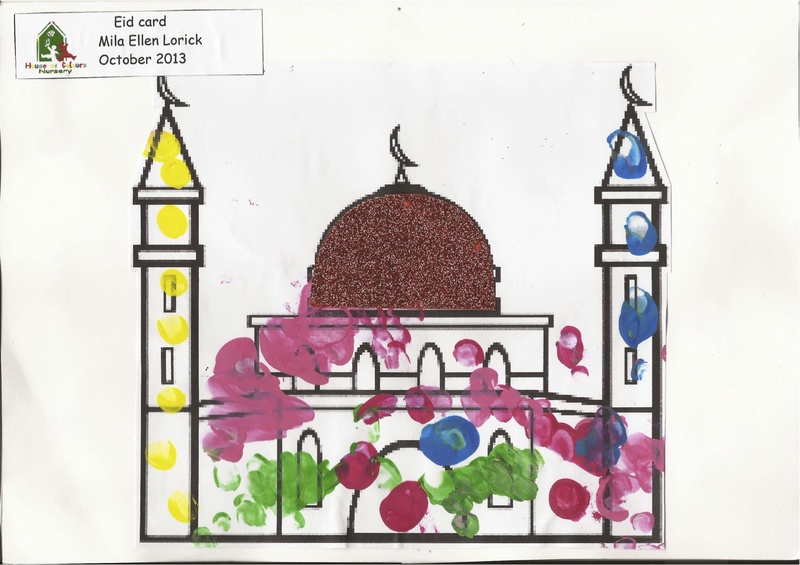 However, I did sit later and ponder about how I felt about my children painting mosque and other important symbols within Islam. I have come to the conclusion that I am not bothered by it at all. We pray that being here will allow our children to say I was taught about Christ and chose him for myself. The cards did, however, validate my beliefs that the US is definitely not a Christian country. Not that I needed further validation but, I can assure you that your child will not leave a public school with a painted church or cross during Easter. How does this holiday affect us? Well, we are off all of next week and our children’s school is closed as well. Since holidays/festivals are both religious and family orientated, there are a lot of festivals and happenings in the country that are child friendly. 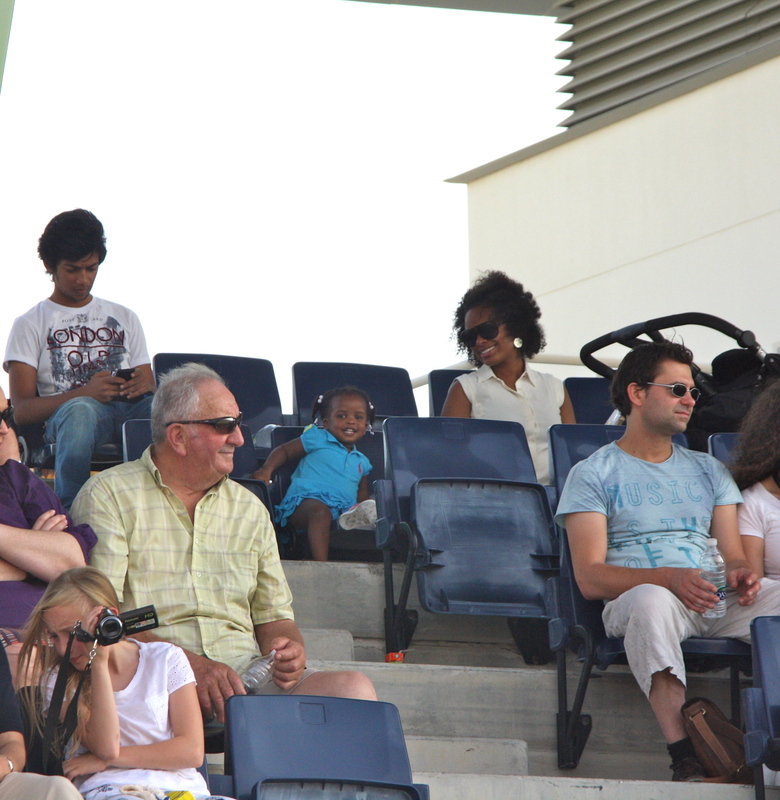 For example, we will be attending “Kidsfest” in Abu Dhabi on Tuesday. Mila will be able to ride on carnival rides, jump in bouncy houses, and have her face painted just to name a few things. 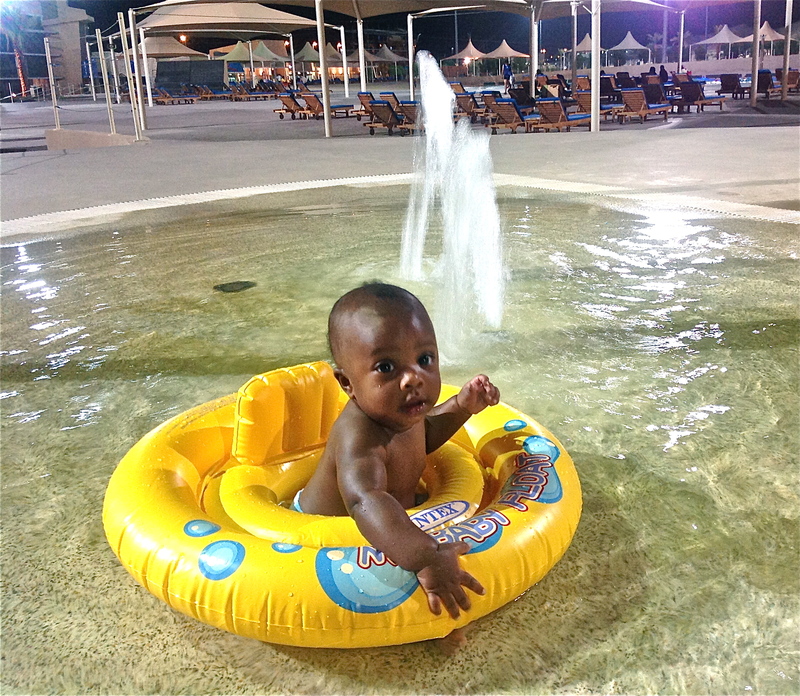 There are also family festivals at beaches throughout our emirate (Abu Dhabi) and Dubai’s. 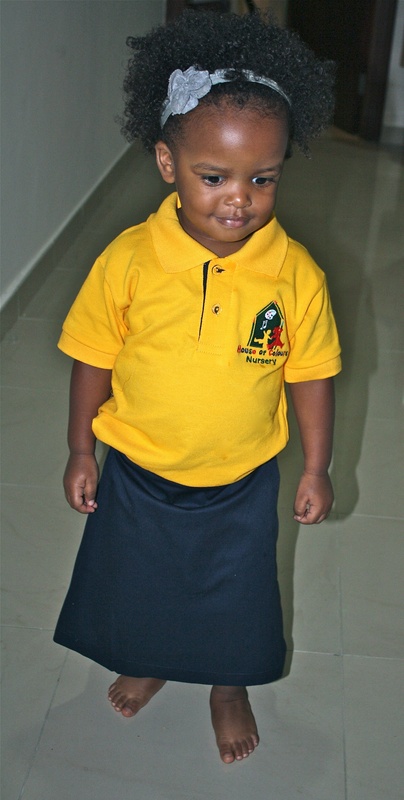 Mila and Aaron’s nursery now requires uniforms for Mila’s class and older. I wasn’t too thrilled about the idea initially, but she’s so cute in it and it makes my life so much easier. I wish they had one for Aaron’s class.